As far as the actual race goes…it was in fact a part of the Rock n Roll Marathon Series. I think it’s safe to say that we were all slightly disappointed in the Expo, as it was much smaller than San Antonio’s and seemed to be missing a ton of vendors. Melissa was the only brave one in the group who chose to ride the mechanical sneaker (yes, exactly like a mechanical bull). She did not injure herself despite the shoe being as Tara had adeptly pointed out, “kind of aggressive.” As far as the course went, it kind of felt like a trail run in the beginning in the sense that you couldn’t take your eyes off your feet. There were so many huge and dangerous pot holes that you really had to watch your step. The course was kind of lame too in my opinion – it had lots of out and back loops where you double back past parts of the same streets that you had already run down. And the second half of marathon course was extremely boring with really nothing to see at all. Additionally, the spectators/crowds were underwhelming. I would say that the Nola crowd was maybe one fourth or even one fifth that of any other “large” marathon crowd. The bands were average – just wasn’t super impressed. Some weren’t even playing when I ran by. The water stations were also subpar as they were always only on one side of the course which caused more congestion than if they could have lined both sides of the street. Probably the most frustrating thing about the race was the fact that there were no Gu stations. It was the first RnR race that I’ve ever done that didn’t have Gu!!! I had only packed one Gu which I took at mile 12 thinking that I could pick up four more and take at miles 15, 18, 21, and 24. It’s probably my fault – if I had read the race literature, I might have learned that they were not passing out Gu and using something else instead (that I was unfamiliar with and didn’t want to experiment with for the first time during the marathon). So I ran the entire 26.2 miles with only a 100 calorie intake!! Yes, another reason that I was dying at the end. One last negative observation about the race – it was a long walk of about 4.5 miles back to our hotel (we uber-ed half of it). Now, there were some good things about the event though. First and foremost would be the unlimited all-you-can-drink post race beer (Michelob Ultra). From what I understand, it’s the only race in the RnR series to offer this feature (usually you just get one beer). Another nice thing about the race was that it is a primarily flat course with no hills, up or down. It also did take us through some beautiful neighborhoods in the beginning and we saw some very impressive historical mansions. All in all, if you’re interested in doing this race, you will have to weigh how important getting to spend the weekend in Nola is versus the petty drawbacks that I mentioned above. Ultimately I’m very happy that I did it and was overall pleased with the experience despite all of my nitpicking. I’m very proud of my run even though I think I’ll be feeling it for the next week or so, haha! I did run a 5k through the French Quarter this morning in an effort to loosen up and while it felt good at the time, I think I actually feel worse now!! While in New Orleans, we did the usual touristy things- wandered around on foot, seeking out fun shopping, eats and drinks. I was shocked to find that there are a vast variety of vegan options in Nola. We even found a raw vegan place as well as a vegan boutique!! 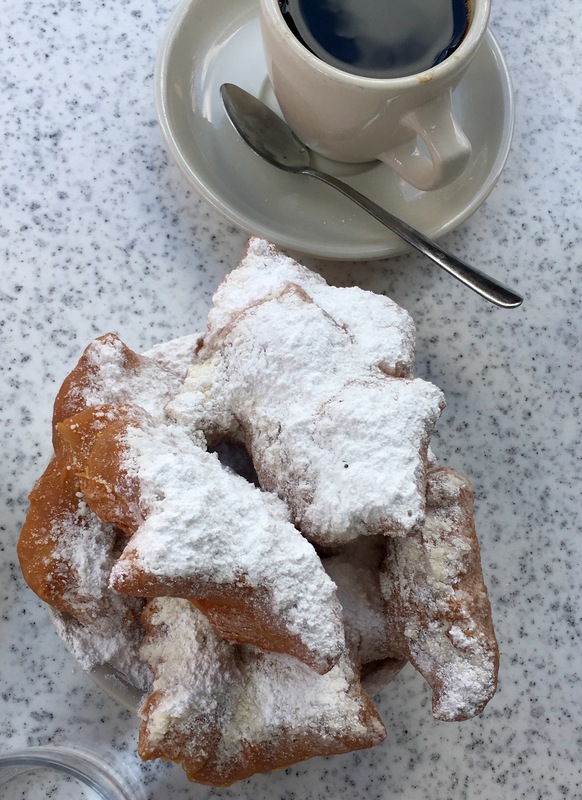 I wasn’t super strict though and definitely had to follow the old adage of “When in Rome,” and for example indulged in some fresh homemade beignets at Cafe Dumond which were delicious! And of course we hit up Bourbon Street, drank Bloody Mary’s and hand grenades, and had fun dancing and people watching! It was an awesome trip. Besides my marathon, the best part was not having an agenda and being able to do whatever I wanted, whenever I wanted, and not having to change any diapers, LOL! Thank you so much Scott, Robert and Glenda for watching the kids so that I could make this trip!! Thank you to Melissa and Tara for running and traveling with me – I couldn’t ask for any better friends to do this with!! A huge congratulations to Melissa too as this was her first ever marathon! We really had a blast and I will cherish this memory forever! Previous Post Ty Baby is 8 months! Next Post Happy 2nd Birthday, Rex! Wow, amazing job!! Especially running that negative split! 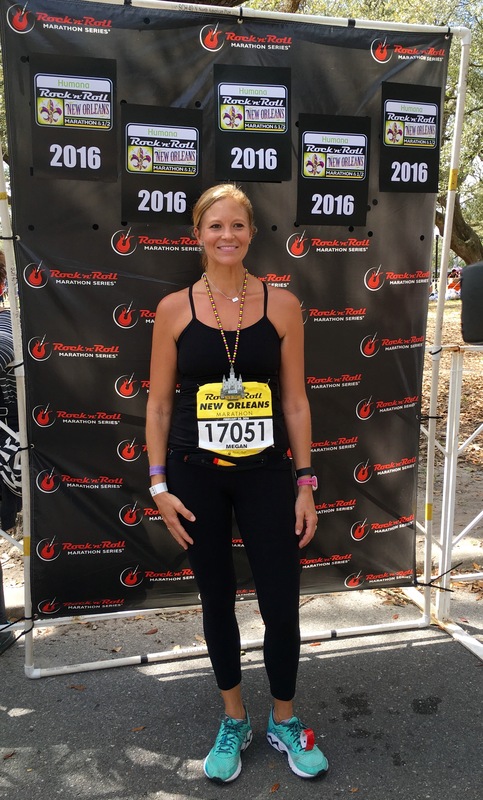 Congrats on finishing the NOLA marathon!! Love the pics!